Body Fat Test was founded by Robb Kelly in May of 2004. In our first year of business we have conducted 100's of body fat tests in the Seattle area. Because bone density plays such a key role in determining your lean mass and thus your body fat percentage, we have expanded our lab to include this service to our clients. 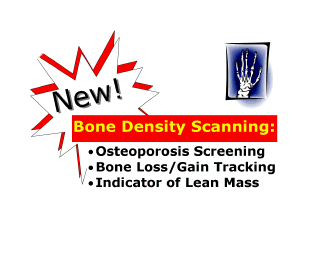 Bone Health Test provides mobile bone density scanning. We use an Osteometer DTX-200 DEXA (Dual Energy X-Ray Absorptiometry) scanner to conduct the tests in our private and self contained clinic, or onsite at a partnership facility. Through our commitment, experience, and expertise Bone Health Test and Body Fat Test have established a business relationship with our customers that will last a lifetime!